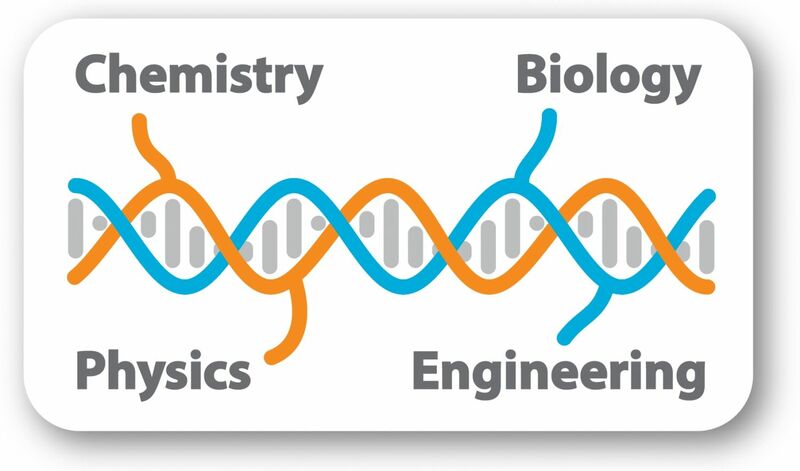 DNA is a unique polymer. It is the information storage molecule of all known life forms, and can be used to build up almost arbitrary structures and patterns out of DNA. These structures can be functionalized with a large variety of inorganic nanoparticles, small molecules or large biomolecules such as proteins and antibodies. Our group is leveraging this programmability to engineer nanoarchitectures and tools for applications in Biophysics, Molecular Biology, Nanophotonics and Nanomedicine. Moreover, we are developing scalable “next-generation DNA synthesis” methods. The field of plasmonics exploits the interaction of light with nanoscale metallic structures to confine, guide and manipulate light on scales below the diffraction limit. Plasmonic structures exhibit significant potential for applications including quantum optics, sensing and short-distance optical communication (a). 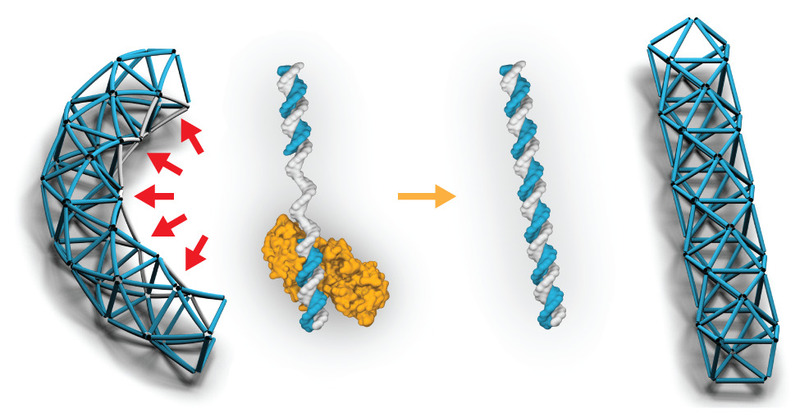 Towards this goal, we demonstrated the precise, robust and high-yield assembly of gold nanoparticles on DNA origami templates (b) F. Gür et al. ACS Nano 2016, 5374-5382. More recently, we realized energy propagation through such a self-assembled waveguide to a fluorescent nanodiamond and out coupling of energy. We analyzed the waveguiding at a single-device level by electron energy loss spectroscopy (c) and cathodoluminescence imaging spectroscopy. Our work visually demonstrates the realization of nanometer-precise light manipulation and energy conversion. Manuscript in review; preprint: arXiv:1712.09141 [physics] 2017. 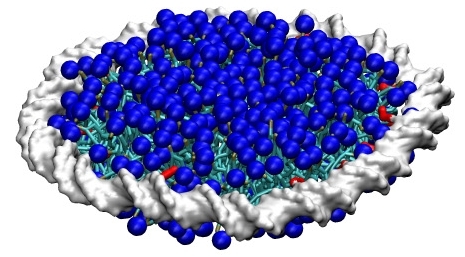 Lipid bilayers and lipid-associated proteins play a crucial role in biology. As in vivo studies and manipulation of single molecules are inherently difficult, several membrane-mimetic systems have been developed to enable investigation of lipidic phases, lipid-protein interactions, membrane protein function and membrane structure in vitro. 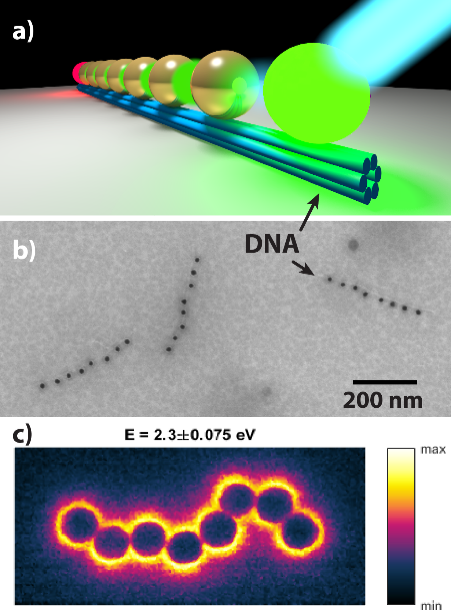 We leverage the unique programmability of DNA nanotechnology to create DNA-encircled bilayers (DEBs). DEBs provide an unprecedented control over size and allows the orthogonal functionalizations and arrangement of engineered membrane nanoparticles. In collaboration w. K. Fahmy (HZDR). Paper in revision; preprint in bioRxiv (https://doi.org/10.1101/285957). Outlook: We want to use DEBS as a tool for biophysical investigation of lipid phases and lipid-associated proteins and complexes including structure determination of membrane proteins. In the macroscopic world, stiff and material-efficient structures such as construction cranes and high voltage transmission towers are usually built from triangulated wireframe structures. We extended the DNA origami concept to generate a series of triangulated trusses. These provide defined cavities that we seek to fill with functional elements. Moreover, we are determining biophysical properties such as their bending and torsional stiffness. Matthies et al. Nano Lett. 2016, 2108-2113. By introducing single-stranded regions edges of the wireframe trusses, the structures are heavily deformed due to the entropic spring forces contracting the single-stranded region. These gaps can be filled by a gap filling polymerase (such as the T4 polymerase). The selective introduction of single-stranded segments (red arrows) curve triangulated trusses. Polymerase-assisted gap filling straightens the trusses. Agarwal et al. ACS Nano 2018, . Outlook: This principle shall be the basis for stimuli-responsive mechanical nano devices in photonics or for applications in molecular biology. Cancer stem cells (CSCs) are responsible for drug resistance, tumor recurrence, and metastasis in several cancer types, making their eradication a primary objective in cancer therapy. In a project lead by Dr. Goncalves, gold nanorods (AuNRs) were functionalized with Nestin-binding peptides that specifically recognize Glioblastoma multiforme (GBM) stem cells for photothermal therapy. Goncalves et al. Acta Biomaterialia 2017, 58, 12-25. Goncalves et al. Biomat. Sci. 2018, 6, 1140-1146. Outlook: We will explore more sophisticated delivery vehicles based on structural DNA nanotechnology for applications in nanomedicine. A main drawback of structural DNA nanotechnology is the instability of structures in biological environments. We developed a protection strategy based on block copolymer micellization which stabilizes DNA structures in biological or low-salt environments. Agarwal et al. Angew. Chemie 2017, 5460-5464. Synthetic oligonucleotides are the main cost factor for many studies in DNA nanotechnology, genetics and synthetic biology that require thousands of these at high quality. 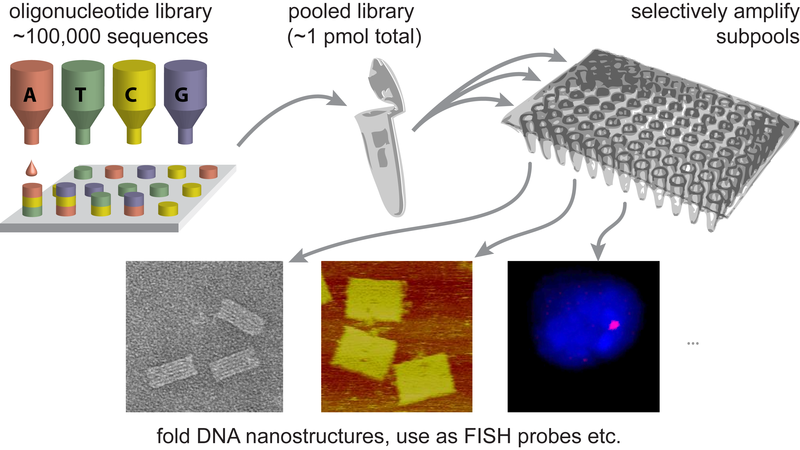 Inexpensive chip-synthesized oligonucleotide libraries can contain hundreds of thousands of distinct sequences, however only at sub-femtomole quantities per strand. We developed a selective oligonucleotide amplification method with a 10-1000-fold cost-reduction compared to synthetic oligonucleotides or competing amplification methods such as PCR. Schmidt et al. Nat. Commun. (2015). During our work on RCA, we discovered that the RCA efficiency is a function of the template length and shows the same periodicity as B-DNA. Coarse grained molecular dynamics simulations (collaboration with Prof. Jon Doye, Oxford) imply that this bias comes from a varying fraying probability of the last two downstream base pairs. We conclude that an increased strain-promoted fraying probability can increase the polymerization rate compared to a relaxed template. Knowledge of this effect is not only important to make our oligonucleotide amplification method more robust, but also needs to be taken into account for various diagnostic and gene sequencing methods relying on RCA. Joffroy et al. Nucleic Acids Res 2018, 46 (2), 538–545. Outlook: We are currently continuing to improve the oligonucleotide amplification method and applying it for new applications in synthetic biology including de novo gene synthesis and structural DNA nanotechnology. Furthermore, we will develop means to circumvent it or counterbalance the length-dependent amplification bias.